Let’s face it, we all struggle at one point or another with keeping our garages clean and organized. For many people, when they have an open space in their home, they feel the need to fill it with anything they can find. Although some people are perfectly fine with using their garage as a junk storage space, many of us are not. The rest of us want to use our garages for what they were intended: storing our vehicles. 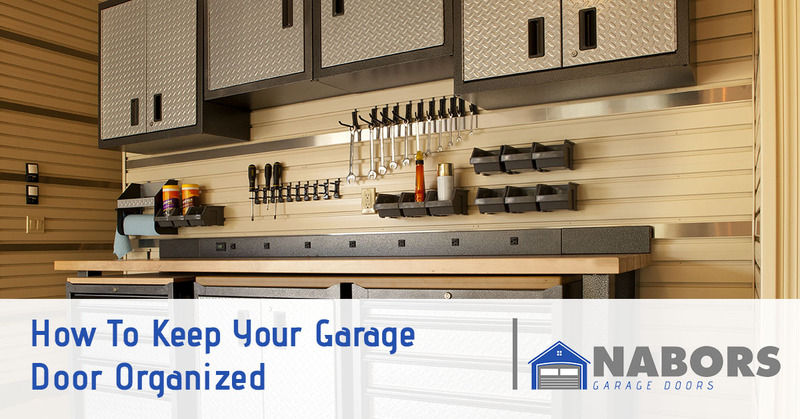 In this blog, we’re going to cover a few helpful tips to keep your garage organized all year long. The first step to organizing any garage is eliminating anything you don’t need. Although you could simply move these to another area of your home, it’s best to get rid of them now to save you time later. Begin by approximating how much you need to get rid of. If it’s not much, you can probably just put it out with your trash to be picked up by your garbage disposal company. However, if you have a lot, you may need to have a runoff dumpster delivered beforehand. Anything that you don’t end up throwing out you can try donating it or asking a neighbor if they need it. If you’re really serious about organizing your garage and keeping it that way, you’re going to need some way of storing things other than just laying them on the ground. Although stacking things may be an effective technique at first, you’ll get to a point where it’s impossible to access the things you need, much less actually find them in the first place. The type of shelving you get will depend on what you’ll be putting on them. To help save even more you can invest in wall-mounted yard tool holders, as well as storage cabinets for any other tools. You should also consider overhead storage options. Since these aren’t accessible without a ladder, you’ll want to use them for things that you don’t need very often. After placing as much as possible on wall-mounted shelves, overhead shelves, and storage cabinets and you still need to clear up space for your car, you may need to result to a shed. Sheds can not only hold a lot, but they’re very convenient for holding yard tools that you use frequently. This way, you won’t have to dig through your garage to find the mower and the extra gas you store with it. One reason many people end up using their garage as a storage space in the first place is that their garage door is broken, unsafe, or the garage door opener is malfunctioning. Even if the track is in good working condition, it’s a huge pain having to get out of the car and open the garage door by hand every time. And if the springs are broken, there’s no way any single person could lift it by themselves. Although you can still access your garage through a side door, this is not ideal. Here at Nabors Garage Doors, we won’t help you clean your garage, but we will certainly ensure your garage door is working correctly, is secure, and is safe to use. Whether you need garage door repairs, garage door replacement, garage door opener repair, or you just need advice on what garage door design is best for your home, we are your local Peachtree City garage door experts. Call us or fill out our online forum to get started.